Forest Kindergarten is where the children's minds, bodies and senses become their pencil and paper. Many schools in Europe have believed strongly in this philosophy for decades, and now the practice is being phased into schools in the United States. It's an educational practice that's driven by nearly 100 percent nature immersion. The children spend the first hour of each day in a traditional school setting, where they learn to sound out words and write. Once that hour is done, the class moves outside and into the woods where, for the remainder of the day, they are learning meaningful life skills while at play. The initiative was first introduced in the United States in 2006 by Erin K. Kenny who has become an internationally recognized expert for work in the Forest Kindergarten pedagogy. Twelve years later, the Holland Christian School District has become the first district in the state of Michigan to launch the program, which began in fall 2018. 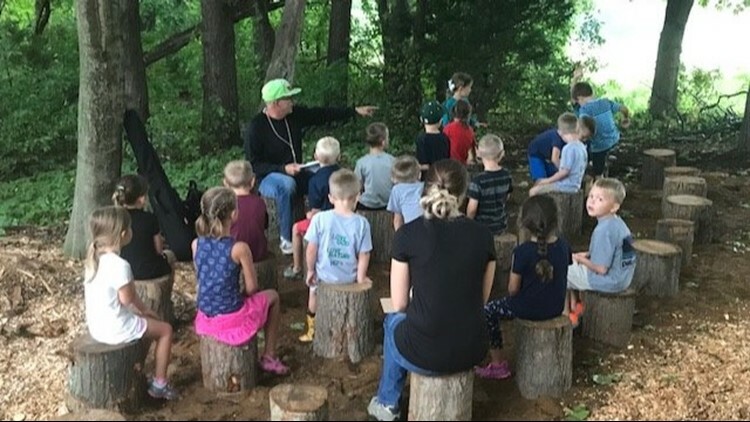 "Childhood is different today," said Miska Rynsburger, principal at South Side Christian Elementary School, who spearheaded the effort to bring Forest Kindergarten to Holland Christian. "It's a challenge to get young children emersed in nature." Beginning in fall 2018, Holland Christian Schools launched an out-of-the-box educational endeavor. It's called "Forest Kindergarten." Students are outside for 6 of the 7 hours of their school day - no matter the weather conditions. Rynsburger says she's been researching the benefits of the Forest Kindergarten initiative for several years. "There's constant physical and emotional learning that translates to academic success," said Rynsburger. She decided to see if it could be phased in at Holland Christian. "I met with several people at the Outdoor Discovery Center in Holland to learn how their nature-based school operates," said Rynsburger. "As discussions continued, we developed a partnership, and that's when it truly felt like Forest Kindergarten could go from dream to reality at Holland Christian." In November 2017, Rynsberger presented the idea to Holland Christian superintendent Dan Meester. "[I told her], you don't have to convince me anymore; the question becomes, how soon can we do this," said Meester. "We then brought it up to our board of trustees, and it didn't take them long to say, 'Let's do it.'" That's when the momentum for Forest Kindergarten really began to generate. "In spring , we opened for enrollment [for the 2018-19 school year]," said Rynsburger. "We wondered, if we build this, will they come? "We didn't have a teacher. "We had an idea and we had some passion." Holland Christian began accepting teacher applications in the spring. It didn't take long to find the person who would be the perfect fit to be the school's first leader of Forest Kindergarten. Holland Christian officials went into the forest and built two woodland-style classrooms for the teacher and students to use when they're not exploring. Traditional desks have been replaced by tree stumps for each student to sit on. They hired Ron Harig, who had previously spent 27 years teaching at the elementary level in the Jenison Public School District which is near Grand Rapids, Mich.
"When I first heard about it, I just started dreaming with my eyes wide open," said Harig. "The more research I did about [Forest Kindergarten], I started to lose sleep over an opportunity to experience this." Once Harig was hired, he started to help prepare the forest, which is located right behind the school. Harig, along with many other volunteers from the Holland Christian community, began cutting down shrubs and dead tree branches, carving out trails and building the two outdoor classrooms. "There are no desks or chairs or a chalkboard," Harig said. "The kids will be sitting on stumps that we cut from trees in the forest." When enrollment opened, there were 22 spots available on Forest Kindergarten. It didn't take long for 18 of those spots to be filled with six girls and 12 boys. "We didn't turn anybody away," said Rynsburger. "There was never any push-back from parents or anybody in the Holland Christian community." The first day of Forest Kindergarten at South Side Christian Elementary School was Tuesday, Aug. 21. The kids spent about 45 minutes in the indoor classroom, then ventured into the woods where they'd spend the next six hours learning while playing. 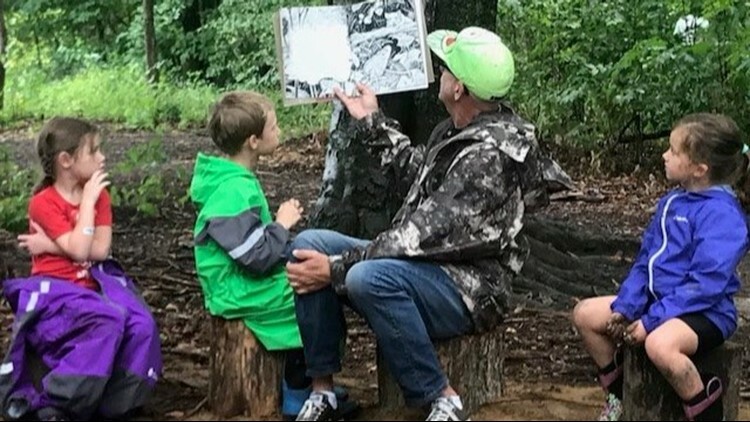 When he's not following his Forest Kindergarten class through the woods exploring, teacher Ron Harig gathers the students on the stumps and reads to them. "The research is showing that kids are spending four to five hours a day with screen time and only 15 minutes outside," said Harig. "Children this age need to run and play on uneven ground, which helps them develop their balance, core strength and fine motor skills." Forest Kindergarten looks and sounds like extended recess, but there's an order and purpose within the chaos. "Forest Kindergarten is a child-inspired curriculum," said Harig. "My job as the teacher is to follow the kid's lead, and celebrate their interests, and look for ways to turn their interests into teachable moments." When the kids aren't running, climbing on fallen trees and exploring, they're sitting on the stumps in the woodland classrooms for reading time and some math. "When we do math, in traditional school setting, it's with unifix cubes an chain links," said Harig. "I have yet as an adult used unifix cubes or chain links to count. "When we do counting in Forest Kindergarten, we'll be counting rocks, acorns and pinecones and whatever else we can find in nature." Midway through the first day, it started pouring down rain. Mr. Harig led the children back inside the school, where each student opened their lockers and pulled out their onesie rain suits. "Let's put on our Oaki-Wear and head back out to the woods," Harig told the kids. 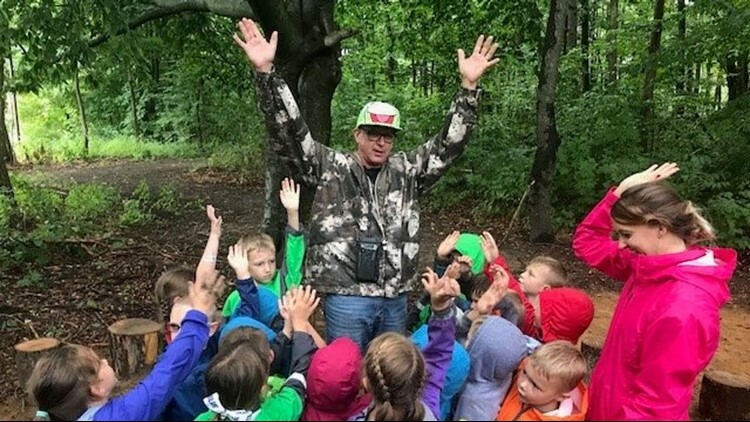 Forest Kindergarten teacher Ron Harig gets the kids excited to go exploring during Forest Kindergarten class. It happened to be raining when this picture was taken. Forest Kindergartners stay outside in all weather conditions. 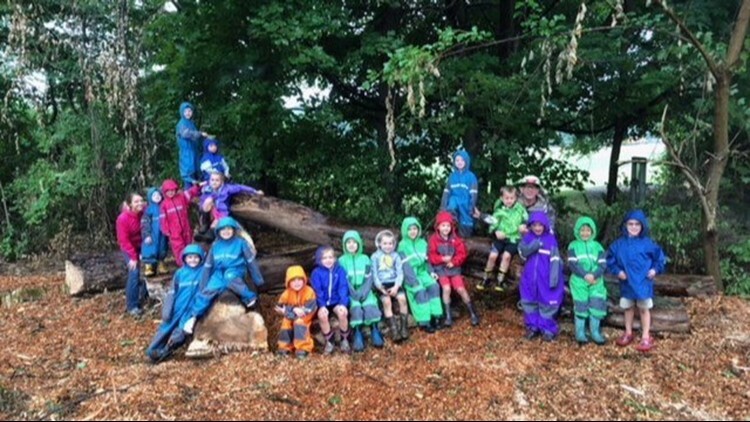 No other kindergarten classes would stay outside during a torrential downpour, but in Forest Kindergarten, that's a key part of the curriculum. "We've always taught kids to stay out of puddles and not to climb on fallen logs because they might get hurt, or play in the mud because they'll get dirty," said Rynsburger. "There's a lot of learning that we're withholding from our kids when we keep them from these experiences." Rynsburger strongly believes that this hands-on, experimental learning is the best educational approach for kids who are of kindergarten age. The Forest Kindergarten philosophy is that when children are at play outside, imagination and creativity become free-flowing. The kids sharpen their balance and sensory integration which ultimately leads to mental clarity and better academic learning. "They're building self-confidence, learning how to problem-solve and strengthening relationship and social skills," said Rynsburger. "They get to resolve challenges, learn self-regulation, develop initiative and emotional intelligence which are all essential skills for future success." "I'm really confident that Holland Christian is going to have a model here that is truly going to be special," said Harig. Miska Rynsburger's dream came to fruition, and now it unfolds daily in the forest. "I believe we owe it to our children to know who they are, to meet their needs and to provide them all they need in order to flourish as a learner," said Rysnburger. The Forest School vision at Holland Christian will continue. The plan is is to add a fully-functioning K-12 Forest School system. Each elementary grade will be added consecutively, one per year, with Forest First Grade being phased in during the 2019-2020 school year. 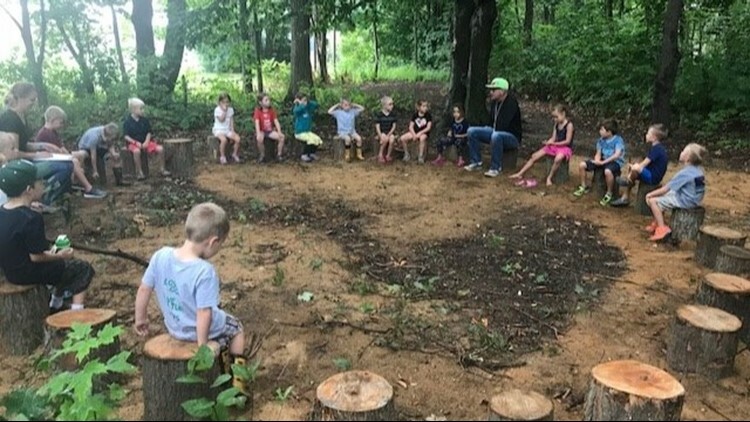 Rynsburger hopes the entire K-12 Forest School program will be added to the Holland Christian School system within the next decade. If you know of a story that should be featured on "Our Michigan Life," send a detailed email to 13 ON YOUR SIDE's Brent Ashcroft at life@wzzm13.com.